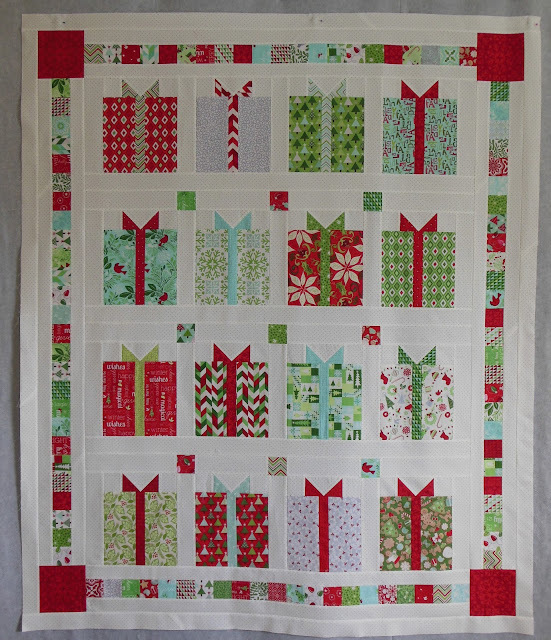 One of my 2016 Quilting Goals is to finish 4 Christmas quilts for gifts this year. I've pieced my first one, 3 more to go. It finished at 55" x 65"
I used random Kate Spain holiday fabrics from several families for this top. 10 inch squares worked perfectly. I think the size and style of this quilt makes it a perfect gift. It could be hung on a wall or used as a lap quilt. I need to not procrastinate on piecing the back and getting it quilted! It is a pretty quilt and I am sure it will be much appreciated. Yay 174 quilts! How do you count them - when you complete the tops? Any particular reason you are making four Christmas quilts? Enquiring minds want to know. This one makes me smile! So bright and happy! Along with the rest of your commenters, I'm looking forward to your next Christmas quilt! I bought some Christmas fabric on sale with hopes of doing just this. You've inspired me. Just a little sewing going on . . .